Background: Cyclin-dependent kinase (CDK) 4/6 inhibitor-based therapies have shown great promise in improving clinical outcomes for patients with hormone receptor-positive (HR+), human epidermal growth factor receptor 2-negative (HER2–) advanced breast cancer. Objectives: 1. Discuss the mode of action of the three CDK4/6 inhibitors in late clinical development: palbociclib (PD-0332991; Pfizer), ribociclib (LEE011; Novartis), and abemaciclib (LY2835219; Lilly). 2. Describe the efficacy and safety data relating to their use in HR+, HER2– advanced breast cancer. 3. Discuss the key side effects associated with CDK4/6 inhibitors along with considerations for adverse event management and patient monitoring. Method: Relevant information and data were assimilated from manuscripts, congress publications, and online sources. Results: CDK4/6 inhibitors have demonstrated improved progression-free survival in combination with endocrine therapy compared with endocrine therapy alone. The side-effect profile of each agent is described, along with implications for patient monitoring, and considerations for patient care providers and pharmacists. Conclusion: Addition of a CDK4/6 inhibitor to endocrine therapy increases efficacy and delays disease progression. 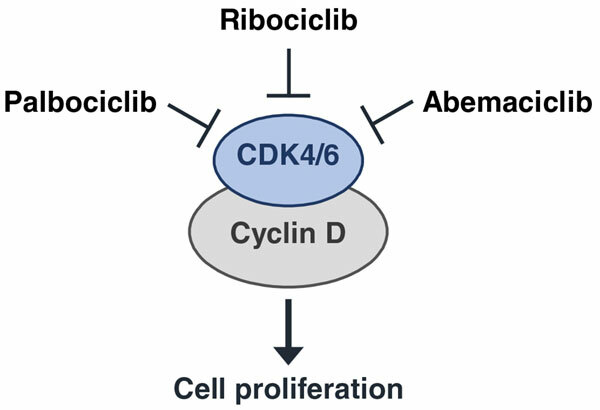 Insight into the unique side-effect profiles of this class of agents and effective patient monitoring will facilitate the successful use of CDK4/6 inhibitor-based therapies in the clinic. Abemaciclib, advanced breast cancer, CDK4/6 inhibitor, hormone receptor-positive, palbociclib, ribociclib.